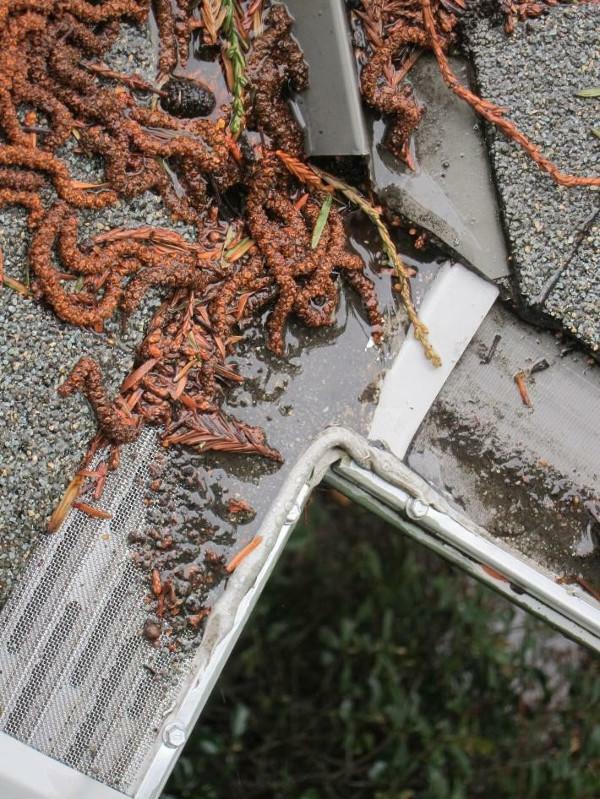 LeafFilter was once one of the better gutter guard options available. But technology has advanced since and now its original inventor, Alex Higginbotham, no longer recommends it as the go-to gutter guard option. Instead, he favors MasterShield®, his new creation. However, there are still other companies offering variations on the original LeafFilter design. We've already looked at Valor Gutter Guards, but how do Gutterdome and Gutterglove hold up? Gutterdome and Gutterglove are incredibly similar products. Gutterdome is merely the lower cost, lower quality knockoff of Gutterglove, which is itself a LeafFilter™ knockoff. Gutterdome does this in an effort to break surface tension. In practice, it just means debris sits at the edge of the roof. Gutterglove is a little better because it has a more equal distribution of debris. There is more debris at the front than at the back. However, both Gutterdome and Gutterglove are installed flattish. 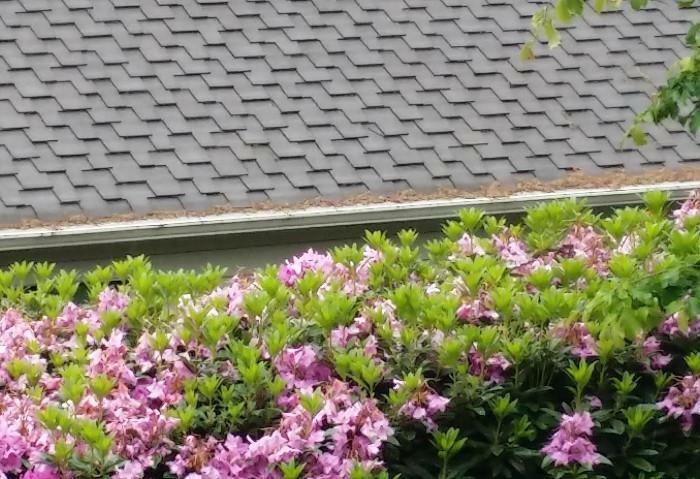 Just like LeafFilter, and just like Valor, and just like all the other similar products, a flat gutter guard or screen will guarantee that the inside of the gutter won't clog AND that you'll be up there, cleaning that puppy for the rest of your life. It also could lead you to thousands of dollars in roof damage because of debris that piles up and channels water uphill. You can see in both of these pictures, for example, how simple shingle grit is already piling up on the gutter filters. You don't even have to imagine what that looks like when you add leaves, pine needles, and water into the mix, because the next pictures show you. Just like LeafFilter™ and Valor, and for the same reasons, Gutterglove switches to a wide mesh in the corners to help account for increased water flow. However, just like LeafFilter™ and Valor, and for the same reasons, Gutterglove just does not perform well here. It's plugged with the grit from the shingles and water just overshoots in the rain. This picture shows the same problem Gutterglove shares with LeafFilter™ and Valor. Here we can see the roof doing an excellent job of shedding debris. Meanwhile, we can see Gutterglove doing an excellent job collecting all that debris. Gutterglove makes many mostly identical products and markets each one under a different name. Gutterglove also makes EasyOn, Atlas, Gutterglove Pro, LeafBlaster Pro (almost identical design as Valor), Ninja Gutter Guard, Raptor Gutter Guard, and probably several more products. Each product seems to be operated by a different company with Gutterglove presiding over them all. Is this a defensive position so that if the name of one gets ruined there are fallbacks? We have no idea. 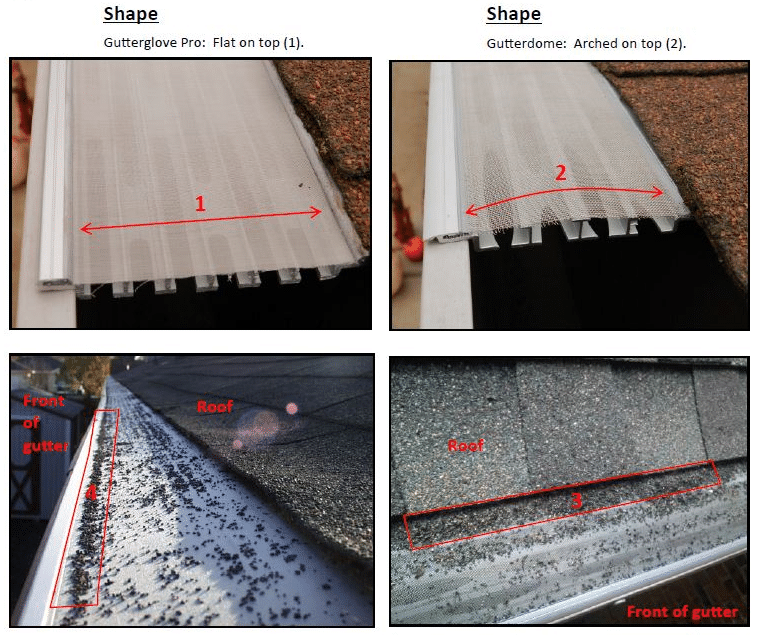 As you might have realized, both Gutterglove and Gutterdome are heavily based on an outdated model and do little to improve the effectiveness of gutter guards. It seems to us then that the best choice is to skip both of them and check out the superior MasterShield® here! Contact us today and schedule your free estimate for a gutter guard installation in Portland, Vancouver, Gresham, and nearby!